The railway company SNCF launched a new business model by using touring coaches that are comfortable. Twenty six new vehicles of the ComfortClass 400 S 416 GT-HD model will link Brussels, Paris, Amsterdam and London and all these 26 are Setra buses. “The Setra coaches will allow us to offer our customers an extremely pleasant way of travelling, with safety as our top priority, ” said Barbara Dalibard, member of the SNCF Executive Board. 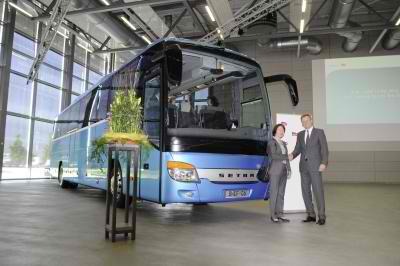 With its fuel-efficiency, Setra is the best bus that a business can use. Comfort and style of the vehicle is great too, thus their clients and tourists will be satisfied. Stuttgart/Paris – France’s state-owned railway company SNCF is launching a new business model that relies on the use of comfortable touring coaches – and thus on the Setra brand. The 26 new vehicles of the ComfortClass 400 S 416 GT-HD model will be linking the major cities of Paris, Brussels, Amsterdam and London from 23 July 2012. The excellent fuel efficiency of these comfortably appointed coaches makes them absolutely ideal for use on long-distance routes. Passengers are able to relax in comfort on these routes, over distances of up to 500 kilometres, in 48 Setra Voyage Plus seats. A special feature of the coaches, which offer full access for the disabled, is the fact that three pairs of cinema-style seats are fixed to “airline” rails, giving the flexibility to move them around to make additional space for a wheelchair. The requisite disabled lift with lift door and lift flap is located on the right-hand side of the vehicle, to the rear of the front axle. This installation, created specifically for the SNCF, together with the special compact design of the lift, ensures that the operator still has sufficient stowage space for luggage in this section of the load compartment. The Lane Assistant system, an Adaptive Cruise Control with Active Brake Assist (ABA) and a Front Collision Guard (FCG) add up to ensure the highest possible level of safety for passengers, drivers and tour guides. 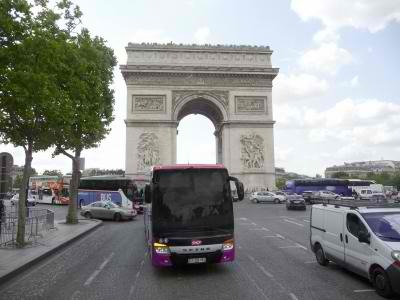 In developing its new long-distance bus routes, the French state-owned company is venturing into completely new territory. Turning to the Ulm-based brand even before the project began meant that all the requests and requirements of this major customer could be incorporated in a specifically developed vehicle design that could then be launched, on schedule, within just one year. Since submission of its first export report, Setra has been on hand to offer advice and support as a full-service provider. The brand, part of the Stuttgart-based Daimler AG, is able to complement the product offering with access to an extensive service network across northern Europe, operated under the Omniplus name. The state-owned railway company SNCF (Société Nationale des Chemins de fer Français) was founded in August 1937 and now operates virtually all rail services right across France, including since 1981 the high-speed train TGV, and sections of the Paris Metro system. The company is based in Paris and employs more than 160,000 staff.